Earn $17.63 in Rewards credit (1763 points) What's This? The pressing issue of the day. If you've got a squeaky, creaky, or grindy press fit-style bottom bracket and don't want to admit defeat by taking it to a service department, Park Tool has you covered. Their BBP-1 Bottom Bracket Bearing Press Set features a quick release design allows the BBP-1 to be as unobtrusive as possible. With 12 precision-machined bushings (in 6 sizes), the BBP-1 is designed for compatibility. 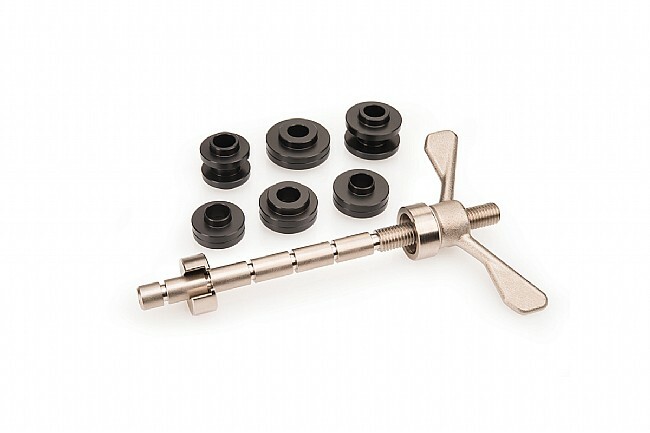 The Park Tool BBP-1 Bottom Bracket Bearing Press Set works on bottom bracket shell widths from 68mm to 150mm. Worked very well for installing bottom bracket.